The first photo is extremely elegant - love the other ones, too. 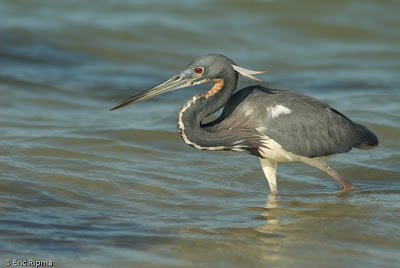 I've never seen a tri-colored heron. Wonderful when the birds cooperate. ;-) Lovely photos. Nice birds. 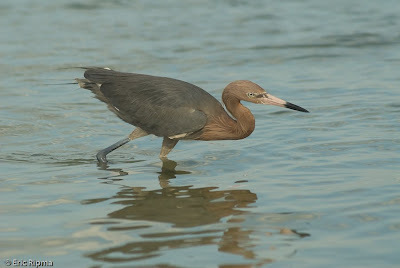 I haven't seen the tricolored heron before. He looks similar to the great blue that I am familiar with. Love the pictures.It's hard to NOT get a good bird photo,there,isn't it? Nice bird shots. 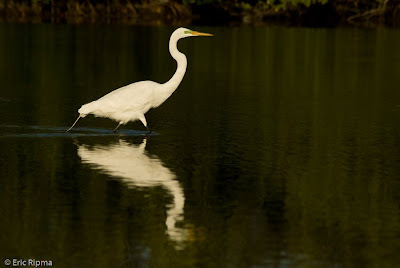 The egret is my fave as I've always loved seeing them when we've been in Florida. Lovely photos but the one of the Great Egret has to be my favourite. I love the reflection you have caught. great photos, but the second one is my favourite. Gorgeous photos. I love the head feathers of the Reddish Egrets. What great pictures. That heron is simultaneously homely, awkward-looking and absolutely gorgeous! Good camera work. It sounds and looks like its not the type of camera you can just stick in you shirt pocket. Although photographers these days have a camera for all occasions it seems. Great captures! That first one has a great color. I see you were using a 70-300mm lens, but what make is it? Such clarity in your photos - Great shots!!! Great shots, I love the reflection in the first one, fantastic. Lovely photos...love the red in the Tricolored's eye. I am very taken with that Tricolored Heron. I don't think I've seen one of those before. What great shots. I do learn so much about the different kinds of birds--love it! Oh egrets are one of my most favourite bird! What wonderful photos of them and the heron too! Excellent blog as well. Thumbsup! Great shots, I have seen the tricolor but never the red (although a friend of mine got a great shot of one! )Have a great WW! I love your birds. That first photo of the egret on the green water background is so lovely. Thank you. @Bryan: I used a Nikon D200 with a Nikon 70-300mm zoom lens.